GET YOUR EARLY BIRD TICKET NOW! Velo-city 2019 will bring global experts in the field of cycling and transport planning to Dublin. The conference, ‘Cycling for the Ages’, will explore visions for the cycling city of the future and how we get there from the cycling city of today; how can we support and design to ensure measures taken are inclusive for all ages, abilities and nationalities. With just over 3 months to go, we are getting ready to welcome over 1500 delegates to Dublin for 4 days of thought-provoking plenaries, programme sessions, exhibitions and networking. In today's interconnected and inexorably linked global society and economy, nothing can happen or be achieved in isolation. 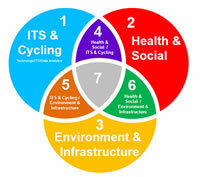 The overlapping sub-themes of Velo-city 2019 Dublin are not only meant to enable an integrated and comprehensive approach to cycling but to demonstrate that 'Cycling for the Ages', requires a systems perspective. Philippe Crist - Advisor for Innovation and Foresight for the International Transport Forum (ITF) at the Organization for Economic Cooperation and Development (OECD). Klaus Bondam - CEO of the Danish Cyclists’ Federation since 2014, representing the interests of and working to improve cyclists’ conditions in Denmark. Amanda Ngabirano - Urban and regional planner, lecturing at Makerere University in Kampala. Amanda is known for her passion about planned physical development for sustainability, vitality and inclusiveness. A welcome reception in the award winning Convention Centre set on the banks of the River Liffey. A Mass Bike Parade through the street of Dublin and a UNESCO Biosphere followed by food and entertainment in the beautiful St. Anne’s Park. A Gala Dinner in the Guinness Storehouse – Ireland’s number 1 Tourist attraction! Early Bird finishes April 1st! Follow us on social media: Facebook, Twitter, Instagram, LinkedIn.